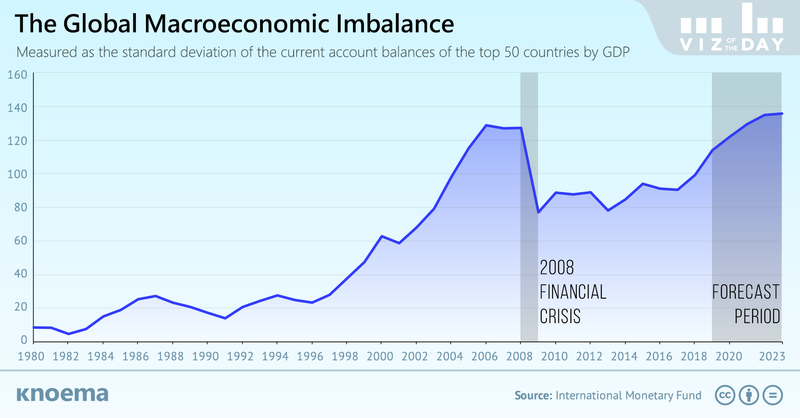 By 2021, the global macroeconomic imbalance may return to the historic 2007-2008 levels that preceded the global financial crisis (aka the Great Depression). A high macroeconomic imbalance may be dangerous as the last time it reached these levels resulted in significant global economic downturn. The global macroeconomic imbalance can be measured as the standard deviation of the annual current account balances (CAB) of the largest economies. As goods and services make up the predominant share of the CAB, for simplicity you can consider the CAB balanced if exports equal imports. A positive CAB means a country’s exports exceed its imports, allowing it to accrue savings (earned from exports), and send those earnings abroad in form of investments and financial flows. Germany and Japan were surplus leaders in 2018. A country with a negative CAB, would in contrast need mechanisms to fund its excessive consumption as it absorbs savings from other countries. The United States holds the largest current account deficit, and it’s only expected to grow, climbing from $516 billion in 2018 to a projected $810 in 2023. Will the current global macroeconomic imbalance prove a harbinger of things to come, a shadow of 2008 cast on the years ahead? This depends largely on how adept deficit countries will be in generating returns on the capital they import. This ability, in turn, depends on their economic growth prospects. The United Kingdom and India, which had the second and the third-largest deficits in 2018, have strong economic growth prospects over the next four years. Growth in the United States and Canada, unfortunately, is expected to only slow.